The second Semi-Final of Sweden’s Melodifestivalen takes place tomorrow night! Another seven acts will take to the stage in hope of a place in the final on March 10th. Amongst the hopeful acts is Stiko Per Larsson. We chatted to him about all things Melfest and his other walks of life! 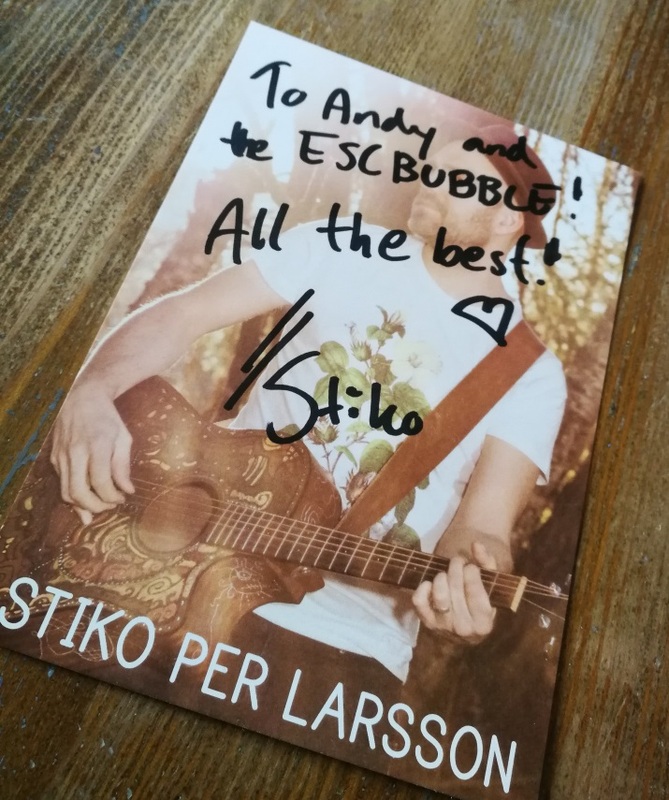 Thanks very much for taking the time to chat to us, Stiko! First off – how would you describe yourself and your music? I come from solid live performing background. I released my first album 10 years ago, and this spring I release album no 6. Over the last years I think I have done somewhere round 100 concerts every year. My music is acoustic pop / rock with Swedish lyrics. was it that made you want to take part this year? totally amazing night. I was so happy. Still am! Melodifestivalen, and how did you manage to keep it all a secret? being announced during the P4Nästa contest. So it was never a secret. If you could describe your song in only three words, what would they be? tempo and kinda happy , I will try to stay in the mood of the song and give my very best on stage. In your photos we can see that you have a very unique looking guitar. Did you design this yourself, and does it have a special meaning to you? Yes, it is really beautiful. I was designed by an artist close to my hometown. He is amazing and it really makes the guitar unique. The design rhymes with who I am and with the song. It fits perfectly in the performance in the contest. songs, which would it be? music in the every day life instead. But I always love to sing great songs, so it happens that I do covers of different artists and put on my Facebook page or YouTube. is called the Butterfly Effect. So even if I wanted to change something it would be a really bad idea. You never know what your actions leads to. That was a really boring answer, hahaha! starring as you? And who would be the co-stars to play your friends/family? foot for eleven years, doing concerts for the benefit of children in need. really can make a difference for people in need. What is your favourite thing about Sweden, and do you have any fun Swedish phrases that you can teach us? I love the nature and how the weather and seasons affects us. The Swedes may appear cool or stiff, but we have a burning heart underneath. understand Swedish a little bit, make sure you follow me on Facebook and Instagram! I just want to say thank for your time! I hope you will enjoy my performance at the Melodifestival and I hope we met again, somewhere down the road. Once again, thanks for taking the time to answer our questions, Stiko! Best of luck at Melodifestivalen! Stiko Per Larsson will perform “Titta vi flyger” (Look, we’re flying) in the 2nd Melodifestivalen Semi-final on Saturday 10th February in Gothenburg.